I recently attended a Lifetime Achievement ceremony for Dale Hatfield at the University of Colorado in Boulder. Hatfield was one of the three founders of Colorado’s graduate Interdisciplinary Telecommunications Program (ITP) in 1977. I enrolled in ITP in 1989 and took, and remember well, Hatfield’s policy class. I run into lots of graduates from ITP. Readers of this blog may be familiar with Martha Buyer or Sorell Slaymaker. There was one alum from my class. I also ran into some former colleagues from my various stints at local employers. There are many ITP alumni at the telecom vendors I cover in this blog. I am not certain if the current program director realized that Dale Hatfield was a founder of the program because his presentation of Dale’s accomplishments went back to his teaching in the 90s. Dale was already an industry legend by the 90s. When I was in the program, there was some flexibility in courses and electives, but we all earned the same degree. Today, there are four formal concentrations: Network Engineering, Network Security, Telecommunications Policy, and Wireless Networking. The ITP Lab was and is an impressive part of the program. In my day, it was mostly about voice and modem technologies. We had equipment from both Northern and AT&T (AT&T designed and developed many of its enterprise PBX products right here in Colorado). We had coils that mimicked long copper lines. Today’s lab has little to do with voice or TDM. The lab has virtual machines running open source apps and tools. Lab exercises include the likes of NetFlow analysis, forensic investigation into hard drives, and design and architecture of Wi-Fi and LTE networks. There was a mandatory thesis in my day. Now, the thesis is optional, and most of the candidates instead choose a capstone project. They have added formal concurrent degrees with the Math, Computer, Engineering, and Aerospace programs. They now leverage the ITP Lab for professional training programs and vendor certifications. They now offer a PhD in Telecommunications. They listed several of the employers that hired recent graduates. The list included Google, Microsoft, Comcast, Dell, and many others. IBM was on the I did an internship at the Boulder campus for two years. A few conspicuously not on the list were Avaya or CenturyLink, (both were major employers in my day when they went by the names AT&T and US West). Two former staff members from my years were also at the event, Mitch and Harvey. Mitch worked in the lab, and Harvey taught me the OSI model. 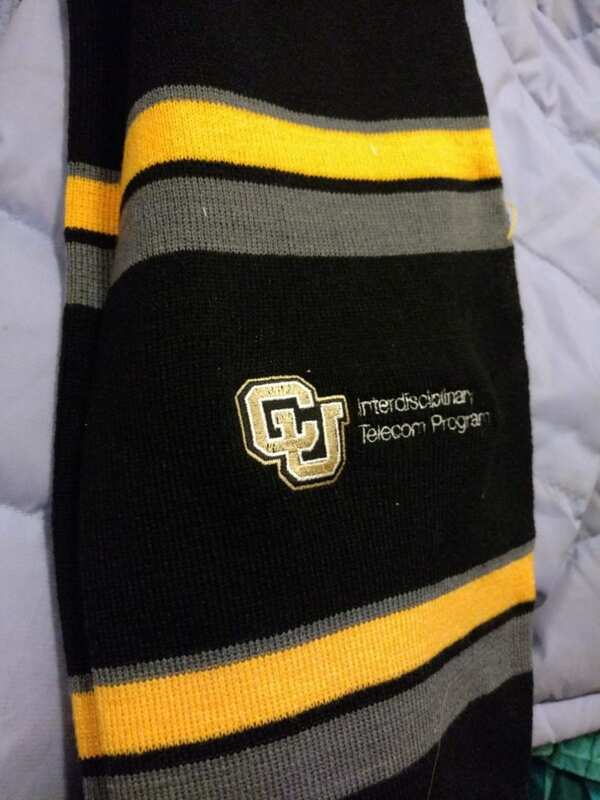 For the most part, I am pleased with myself for attending CU ITP. Most of what they taught me was true, and as far as college educations go, it had a reasonable half-life. It’s impressive how much things have changed. I wonder if graduates from other disciplines notice so much change in the same period of time. It was nice to visit campus again. Plus I scored a new ITP scarf.